The Royal Mail has launched what it claims is the world's first "intelligent" stamp. Also required is the Junaio image recognition application - versions of which have been made for iPhone and Android smartphones. The Royal Mail said intelligent stamps "mark the next step in the evolution of our stamps, bringing them firmly into the 21st Century." Those viewing the stamp, part of the Royal Mail's latest Great British Railways edition, via the Junaio app will be directed to a short film showing Bernard Cribbins reading Auden's famous poem The Night Mail. "WH Auden wrote the Night Mail poem in 1936 for the Post Office's own blockbuster film of the same name, which has for years remained in the hearts and minds of many," said Mr Cribbins. 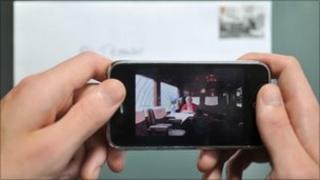 The application is another example of augmented reality in which real world scenes or situations are annotated and enhanced by pairing them with web-based data. One AR app for smartphones lets owners use the camera on the gadget to effectively see through buildings to find the nearest tube station. The Royal Mail's Philip Parker said: "This is the first time a national postal service has used this kind of technology on their stamps and we're very excited to be bringing intelligent stamps to the nation's post. "Royal Mail's special stamps mark key events and anniversaries in the UK's heritage through a programme which aims to be both educational and informative. "Through intelligent stamp technology, our stamps will open up to a whole new world of information, interest and fun to collectors and the millions of people who will receive them on letters in the coming months alike." The technology will also be made available on selected future special stamps.